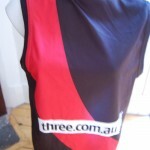 In 2010 the AFL informed the Bombers they needed a clash strip different to their traditional team colours of red and black . The club opted for red, black and grey. The grey came from the background of their logo and was deemed as a heritage strip by the Club. 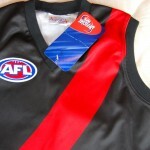 In 2013 the AFL decided the Bombers could revert to their traditional strip of red and black for all matches. 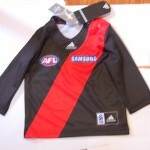 The Bombers fans know their team are always wearing red and black football jumpers, jerseys, guernseys. These colours are the traditional team colours of the Club, dating from 1896, when they joined the VFL, which later became the AFL. 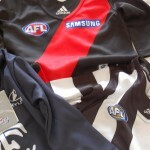 Will the red, black and grey footy jumpers, jerseys, guernseys become collectors items? Probably. Time will tell. This entry was posted on Friday, December 18th, 2015 at 10:46 pm	and is filed under AFL, football jumpers. You can follow any responses to this entry through the RSS 2.0 feed. Both comments and pings are currently closed.